Stan Winston and his crew on the set of Predator. 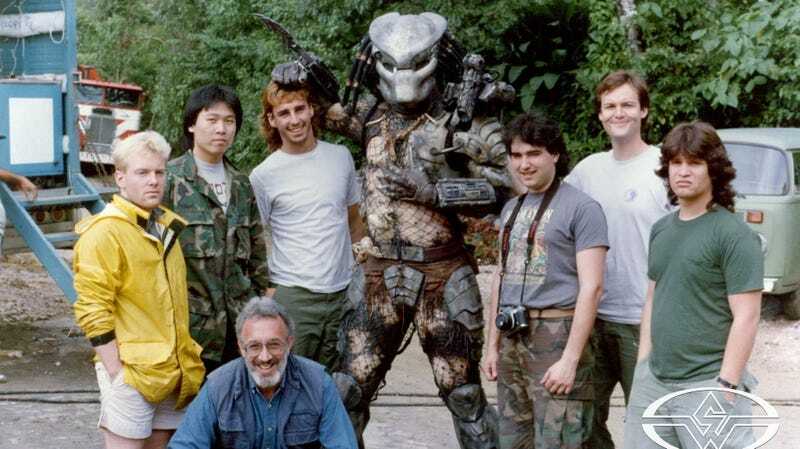 Left to right: Shane Mahan, Steve Wang, Stan Winston (crouching), Brian Simpson, Kevin Peter Hall (as Predator), Shannon Shea, Richard Landon, and Matt Rose. A huge part of why the Predator franchise is still relevant is the work of Stan Winston and his team. Their Oscar-nominated creature effects on the original 1987 film turned what could have been just a simple, scary monster into something iconic and timeless. The story of creating that amazing creature is the subject of this new video posted by the Stan Winston School of Character Arts, and it’s a true testament to the magic of filmmaking. Check it out. Now, creating something so detailed, scary, and awesome was not simple task. In fact, it was a constant struggle, with pieces of the suit falling off, different mechanical aspects malfunctioning, you name it. We know this thanks to another video posted by Winston’s school. This one is much older, but it’s an excellent look back at the difficulties Winston and his team had creating the Predator, and how the now seasoned effects veterans hold the experience with reverence. Both videos come courtesy of the Stan Winston School of Character Arts, who also have a fantastic write up on Predator. You can read that at this link. It, as well as these videos, are a great reminder of why, in 2018, the Predator is still taking spines all across the galaxy.